Swamp Meadow Receives 5 Motif Nominations! You can view the complete list of nominees (see Page 22) and you can vote online. Congratulations to all of the nominees! I consider myself a Christmas Carol connoisseur. I have imbibed in many variations on the theme in the form of musicals, Mister Magoo, or the Muppets, comparing their merits like the arbiter of taste. Every year brings a harvest of new adaptations of the old story, starring everyone from Mickey Mouse to Barbie. Many would say the reason it has survived to remain a household name over 170 years is that the story is timeless. If A Christmas Carol really is timeless, then what could a modern update bring to the table that hasn’t already been brought? 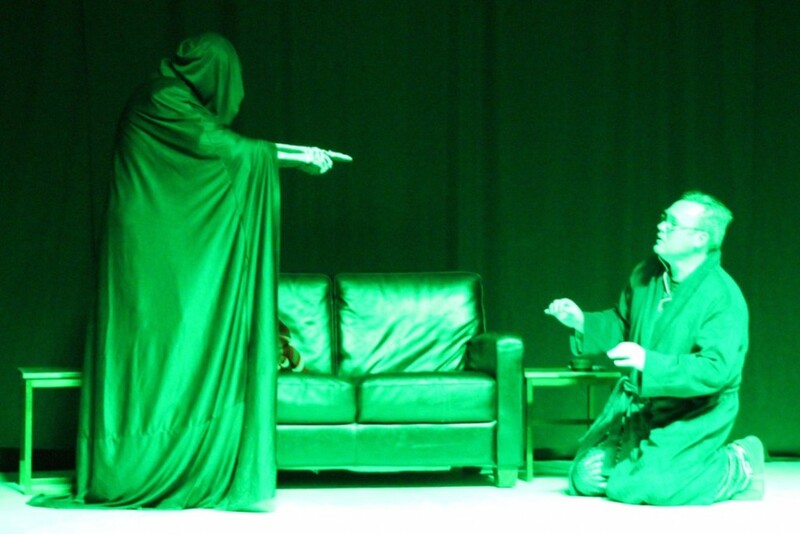 Swamp Meadow Community Theatre’s A Christmas Carol 2015, written and directed by Chris Brostrup-Jensen, is a modernized adaptation of the holiday classic. This updated version trades the Dickensian time and place for one that hits closer to home, literally and figuratively, at times uncomfortably familiar. Watching the characters debate medical ethics, struggle with minimum wage insurance gaps, and visit a shelter for immigrants is painfully relevant. The actors and the crew form a microcosm of today’s America indistinguishable from reality. A 21st century setting gives the characters free reign to reference modern media without appearing anachronistic. It’s the subtle language alterations that remove the story from the relative obscurity of the mid-1800s and place it into a more relatable context that blurs the lines between fiction and reality. The smallest details, like the sound of a phone alarm buzzing or the beeping hospital machinery, offer more anxiety to the modern viewer than the ringing of bells or the dousing of candles, and passing references to Lord of the Rings and Star Trek make me feel like these are people living around me. Even the characters have evolved slightly in this rewrite. Bob Cratchit is renamed Barbara, and is a working mother supporting a family of six on a minimum wage salary. And, though treatment exists, there is no medical insurance for Tiny Tim, a modern day tragedy if ever there was one. In most versions I’ve seen, Scrooge is an archetype who is impenetrably bitter for the sake of being bitter. Here, he is more sarcastic than angry, and the audience can’t help but imagine that he’s using his own passive-aggressive indifference as a defense mechanism. His entire life is built around physical, emotional, and monetary self-preservation, and only when he sees how this mindset affects the past, the present, and the future does he realize what a fragile foundation it is. It’s true; A Christmas Carol really is a timeless story. Every holiday has its Scrooges, every Scrooge has his Christmas. But times have changed, and so has the sympathies of the audience. The spirit (and the Spirits) is still there, but Swamp Meadow’s play shows not only that it’s still relevant, but why it’s still relevant. While the appeal of the original is a nostalgic product of the past to be passively consumed as fiction, this is an ubiquitous representation of the present, one that we can still change. For the sake of Christmas Future, let’s hope we make the right choice. A Christmas Carol 2015 opens on December 5, 2015. Follow these links for the official production page, trailer video and reservations. The play begins with Rob Silva as Stage Manager standing center stage. He narrates the play and moves scenes along for the audience. The Stage Manager also offers his opinion, some foreshadowing, and an inside look at the facts concerning Grover’s Corners. Multiple incarnations of Emily Webb and George Gibbs take the audience through a seemingly simplistic daily life. Emily and George’s family intersection is told in whole — alongside the tale of townspeople and assorted family members. Love, marriage and death magically unfold in less than two hours. The story is one of both tragedy and comedy, as is often seen and lived in one’s life. Cast member Michelle Chretien (Mrs. Soames) has performed with Swamp Meadow over thirty times and was “excited to work with a new director.” James Boss (Joe & Si Crowell), age 7, talks about his favorite part of the process as being included in the play and meeting new friends. Also, in his words: “I like to be on the stage.” Olivia Hussey (Emily Webb, Act 2) recalls a funny moment in rehearsals when the wedding vows were sealed differently between her and Connor (George Gibbs Act 2 and 3). “I was sick and did not want Connor to get sick, so we planned a high-five instead and didn’t tell anyone.” Chloe Anderson-Boss (dead person) was happy to be a part of the show, having been called in three weeks before show-time when Tim needed another body onstage for the graveyard scene and Chloe’s mom volunteered her! Said Jon Howe (Wally Webb); “Til death do we join!” All in all, rehearsals were the clichéd time of bonding, sharing laughs and getting to know one another better…but the cliché is so true it is hard to put it any other way. 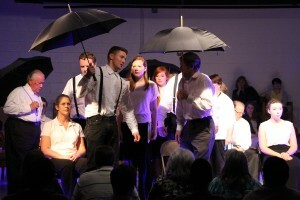 Performed in the round, each performance of the opening weekend left the audience intrigued. Audience members commented, “You [the cast and directors] should be proud of yourselves.”, “How fantastic!”, and “This was completely enjoyable, we loved it.”. Laughter punctuated Acts 1 and 2 but Act 3 brought the audience to tears. There is still time to see this show. Three performance will be held at Captain Isaac Paine School in Foster, at 7:00 pm October 24 and 25, and a 2:00 pm matinee on October 26. Our third episode is an interview with Tim Hillman about directing Our Town (our fall show). And we have new theme music courtesy Seventh Constellation (Maia Grandy, Hannah Gibb, Izzi Giorgianni, and Sean Grandy).